…of ceiling fans?? I can honestly say, I am not. The new house is actually making me think about this topic more than any normal being generally should. With the house, we inherited a very nice ceiling fan in the living room and an older fan in the kitchen. We have no central air (YET), so I imagine they prove to be very practical, however I’d rather not look at them! My big issue is the living room fan. Brand new with wall controls… and no light. 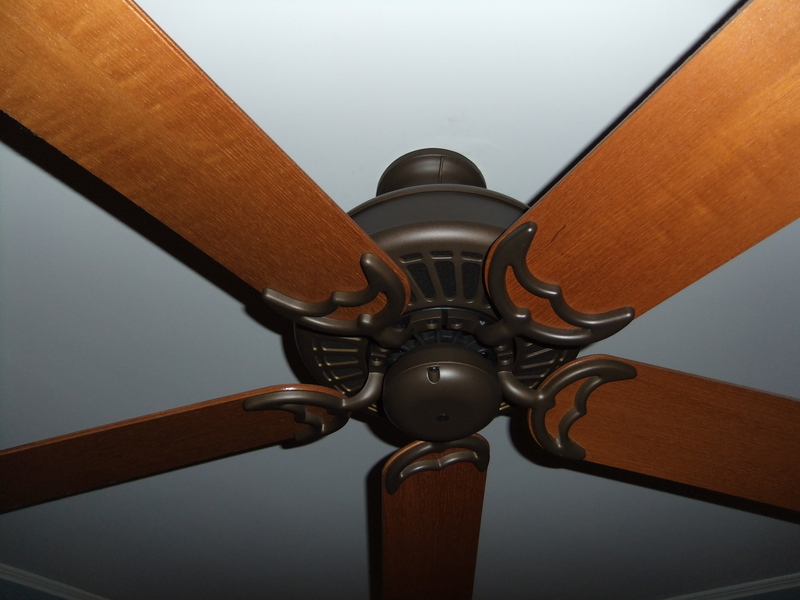 The ceiling in this space is less than 8′ and as you can see, the fan is a dark finish and hangs down over a foot. 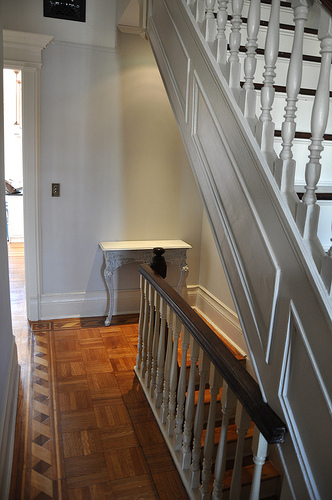 In one of the smaller spaces in the house, the fan just closes it in even more! I have a beautiful light in mind and will post pictures once I order and install it. How do you feel about ceiling fans in design? I’d love to hear your comments on the topic! I have become consumed with packing, holiday shopping, organizing, and generally acting like a crazy person. We close on the 21st and am TRYING not to think too much about decorating/design until the house tells me what it wants. Alas, I’m unsuccessful, so please enjoy a group of images I’ve collected from other blogs for inspiration. Simple sophistication with a clock to die for (in the back corner). Potential for the wall in the office. This will be a great way to display Hubby's required framed sports tickets and still add some decorative flare. Perfect way to dress up a tv. Wishing I had a fireplace in the new house. I've had the idea stuck in my head lately of bench seating at a dining table- then I saw this. Very chic!